Grilled Swordfish, Thyme for Cooking summer main course. 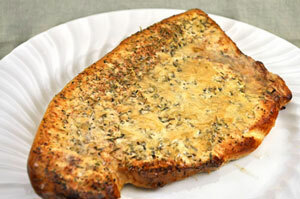 You can use any fish suitable for grilling - tuna, swordfish, halibut, snapper. They would all pair well with the olive sauce. If you get sushi-grade tuna or swordfish you will want them seared but rare to medium-rare in the center. Any leftover Olive Sauce can be used with other grilled meats or simply eaten with savory biscuits. Brush fish lightly with olive oil and sprinkle with herbs. Put fish in a grill basket or cook on a grill pan, particularly if the fish is thinner filets. Cook on barbecue grill for 2 - 6 minutes per side, depending on thickness and grade of fish. Walleye or snapper will become opaque when done. Good tuna or swordfish you just want to brown the outside quickly. 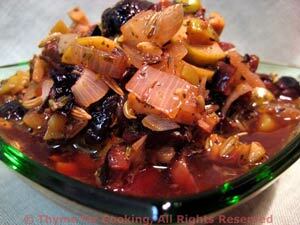 When done, put on a small platter, spoon some Olive Relish on and serve, remaining sauce on the side. Heat oil in small nonstick skillet. Add shallots, garlic and sauté until tender, about 5 minutes. Add fennel seeds, herbs and sauté 1 minute longer. Add olives, lemon and wine. Bring to a boil, reduce heat and simmer 1 minute. Remove from heat, put into a small serving bowl. Cover to keep warm until ready to use.